My response is that not only will a grateful attitude help—it isessential. In fact, it is precisely under crisis conditions when we have the most to gain by a grateful perspective on life. In the face of demoralization, gratitude has the power to energize. In the face of brokenness, gratitude has the power to heal. In the face of despair, gratitude has the power to bring hope. In other words, gratitude can help us cope with hard times. But it is vital to make a distinction between feeling grateful and beinggrateful. We don’t have total control over our emotions. We cannot easily will ourselves to feel grateful, less depressed, or happy. Feelings follow from the way we look at the world, thoughts we have about the way things are, the way things should be, and the distance between these two points. Trials and suffering can actually refine and deepen gratefulness if we allow them to show us not to take things for granted. Our national holiday of gratitude, Thanksgiving, was born and grew out of hard times. The first Thanksgiving took place after nearly half the pilgrims died from a rough winter and year. It became a national holiday in 1863 in the middle of the Civil War and was moved to its current date in the 1930s following the Depression. Why? Well, when times are good, people take prosperity for granted and begin to believe that they are invulnerable. In times of uncertainty, though, people realize how powerless they are to control their own destiny. If you begin to see that everything you have, everything you have counted on, may be taken away, it becomes much harder to take it for granted. So crisis can make us more grateful—but research says gratitude also helps us cope with crisis. Consciously cultivating an attitude of gratitude builds up a sort of psychological immune system that can cushion us when we fall. There is scientific evidence that grateful people are more resilient to stress, whether minor everyday hassles or major personal upheavals. The contrast between suffering and redemption serves as the basis for one of my tips for practicing gratitude: remember the bad. It works this way: Think of the worst times in your life, your sorrows, your losses, your sadness—and then remember that here you are, able to remember them, that you made it through the worst times of your life, you got through the trauma, you got through the trial, you endured the temptation, you survived the bad relationship, you’re making your way out of the dark. Remember the bad things, then look to see where you are now. This process of remembering how difficult life used to be and how far we have come sets up an explicit contrast that is fertile ground for gratefulness. Our minds think in terms of counterfactuals—mental comparisons we make between the way things are and how things might have been different. Contrasting the present with negative times in the past can make us feel happier (or at least less unhappy) and enhance our overall sense of well-being. This opens the door to coping gratefully. Try this little exercise. First, think about one of the unhappiest events you have experienced. How often do you find yourself thinking about this event today? Does the contrast with the present make you feel grateful and pleased? Do you realize your current life situation is not as bad as it could be? Try to realize and appreciate just how much better your life is now. The point is not to ignore or forget the past but to develop a fruitful frame of reference in the present from which to view experiences and events. There’s another way to foster gratitude: confront your own mortality. In a recent study, researchers asked participants to imagine a scenario where they are trapped in a burning high rise, overcome by smoke, and killed. This resulted in a substantial increase in gratitude levels, as researchers discovered when they compared this group to two control conditions who were not compelled to imagine their own deaths. In these ways, remembering the bad can help us to appreciate the good. As the German theologian and Lutheran pastor Dietrich Bonhoeffer once said, “Gratitude changes the pangs of memory into a tranquil joy.” We know that gratitude enhances happiness, but why? Gratitude maximizes happiness in multiple ways, and one reason is that it helps us reframe memories of unpleasant events in a way that decreases their unpleasant emotional impact. This implies that grateful coping entails looking for positive consequences of negative events. For example, grateful coping might involve seeing how a stressful event has shaped who we are today and has prompted us to reevaluate what is really important in life. A growing body of research has examined how grateful recasting works. In a study conducted at Eastern Washington University, participants were randomly assigned to one of three writing groups that would recall and report on an unpleasant open memory—a loss, a betrayal, victimization, or some other personally upsetting experience. The first group wrote for 20 minutes on issues that were irrelevant to their open memory. The second wrote about their experience pertaining to their open memory. Researchers asked the third group to focus on the positive aspects of a difficult experience—and discover what about it might now make them feel grateful. Results showed that they demonstrated more closure and less unpleasant emotional impact than participants who just wrote about the experience without being prompted to see ways it might be redeemed with gratitude. Participants were never told not to think about the negative aspects of the experience or to deny or ignore the pain. Moreover, participants who found reasons to be grateful demonstrated fewer intrusive memories, such as wondering why it happened, whether it could have been prevented, or if they believed they caused it to happen. Thinking gratefully, this study showed, can help heal troubling memories and in a sense redeem them—a result echoed in many other studies. Some years ago, I asked people with debilitating physical illnesses to compose a narrative concerning a time when they felt a deep sense of gratitude to someone or for something. I asked them to let themselves re-create that experience in their minds so that they could feel the emotions as if they had transported themselves back in time to the event itself. I also had them reflect on what they felt in that situation and how they expressed those feelings. In the face of progressive diseases, people often find life extremely challenging, painful, and frustrating. I wondered whether it would even be possible for them to find anything to be grateful about. For many of them, life revolved around visits to the pain clinic and pharmacy. I would not have been at all surprised if resentment overshadowed gratefulness. As it turned out, most respondents had trouble settling on a specific instance—they simply had so much in their lives that they were grateful for. I was struck by the profound depth of feeling that they conveyed in their essays, and by the apparent life-transforming power of gratitude in many of their lives. It was evident from reading these narrative accounts that (1) gratitude can be an overwhelmingly intense feeling, (2) gratitude for gifts that others easily overlook most can be the most powerful and frequent form of thankfulness, and (3) gratitude can be chosen in spite of one’s situation or circumstances. I was also struck by the redemptive twist that occurred in nearly half of these narratives: out of something bad (suffering, adversity, affliction) came something good (new life or new opportunities) for which the person felt profoundly grateful. Gratitude helps us cope with adversity, but that’s certainly not its only benefit. 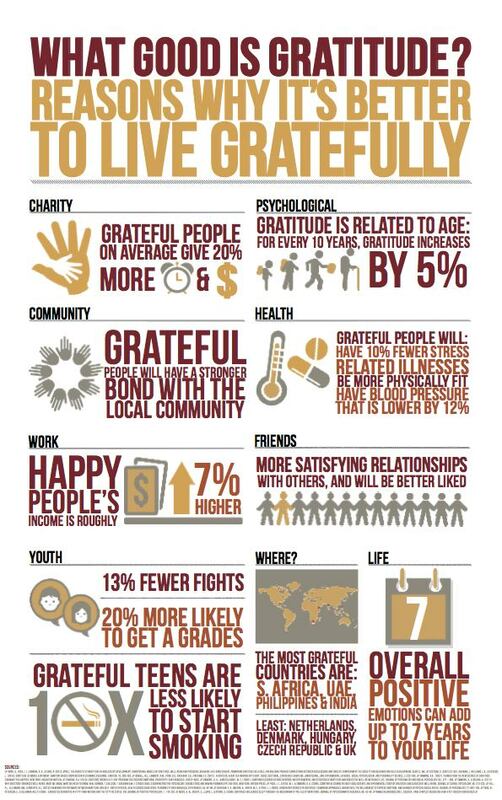 For more reasons why to practice gratitude, check out this infographic created by Here’s My Chance. This article originally appeared on Greater Good, the online magazine of UC Berkeley's Greater Good Science Center. It is reprinted here with permission. Robert A. Emmons, is the world's leading scientific expert on gratitude. He is a professor of psychology at the University of California, Davis, and the founding editor-in-chief of The Journal of Positive Psychology. He is also the author of the books Thanks! How the New Science of Gratitude Can Make You Happier and the new Gratitude Works! 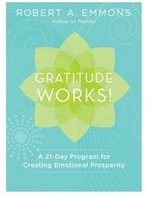 : A 21-Day Program for Creating Emotional Prosperity, from which this essay is adapted.